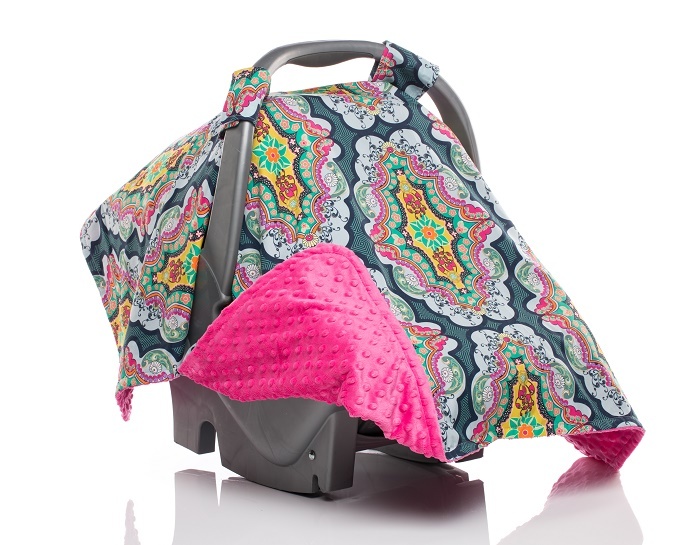 Carseat Canopy is a maker and retailer of covers for baby carriers and baby car seats. These protect the baby from the cold or sunlight, and reduce stimuli so they can sleep. It is one of several baby product brands owned by Mothers Lounge, a privately held company which is headquartered in Pleasant Grove, Utah, USA. Customize your Carseat Canopy with your baby’s name or term of endearment. Just add the canopy to your cart and follow the simple instructions to personalize it. Other properties include Seven Slings (sling based baby carriers), Milk Bands (for breastfeeding), Nursing Pillow, Baby Leggings, Breast Pads, and several others. Carseat Canopy's online store can be found at carseatcanopy.com. They are constantly running great offers and deals which you can redeem with Carseat Canopy coupons. We list all the latest coupon codes here at Coupofy, so be sure to check back before ordering. 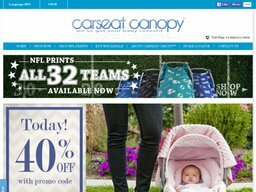 Carseat Canopy was launched as online retailer in 2011 by Jenny Pierce, as an expansion of her Mothers Lounge company. She wanted to add more variety to the baby seat cover (canopy) market, so began selling her own stylish designs. Since then she has also made partnerships with the likes of the NFL to sell officially licensed canopies. In recent years agreements have been made for outlets and distributors in several countries to carry the Carseat Canopies, including Canada, Argentina and Australia. Mother Lounge products are also stocked by retailers across the United States, such as Motherhood Maternity, Motherhood at Macy's, A Pea In The Pod, and Babies 'R' Us. Carseat Canopy's products are made from various materials depending on the which you choose. They are usually a combination of cotton and polyester. You can either choose single canopies that are simply fitted over the arms of the baby carrier, or you can go for a 4 piece set, which includes the canopy, but also a Minky Slip Cover, Minky Head Support Pillow, Baby Lap Blanket, and a replacement Umbrella. There are a wide variety of styles and patterns to available, from camo to flowery patterns, to some that are almost psychedelic. There is now also a range of official NFL canopies for teams like the Baltimore Ravens, Chicago Bears, Dallas Cowboys, Green Bay Packers, New England Patriots, and more. These designs are usually the team's logo repeated in to a pattern. Carseat Canopy also maintains a Youtube channel featuring testimonials about their products, a guide on how to install your canopy, and various commercials and promotions. You can use special coupon codes during the checkout process to make savings on all of your Carseat Canopy purchases. Whenever new offers and discounts are made available Coupofy Coupons will update the list, meaning you'll always find something you can use. Carseat Canopy is secured by Paypal allowing you to use your Paypal balance, Paypal credit, or any credit card you have on file. It should be noted that your delivery address should match the address on Paypal to prevent confusion. If you wish to redeem a Carseat Canopy coupon code simply enter it in to the designated box during the checkout process. If it is a discount code you should then see the total order value drop. The CarseatCanopy online store caters to both US and international customers, and will automatically display local currencies for certain countries like the UK. Standard shipping within the United States costs $14.99. The cost of shipping to other countries varies but will be displayed clearly before the checkout process is complete. Form time to time you can also redeem a Carseat Canopy shipping coupon to get free shipping. Only items that are damaged or defective upon receipt can be exchanged or refunded. Returns should be initiated within 30 days of receipt with a photo of the damage.